Strange to know that not a single native Wireless USB peripheral has been released to date, and yet this long delay has not caused anyone to stop coming up with new concepts that will utilize wireless USB. 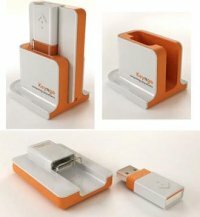 Touch360 has an example where transferring data to a USB flash drive will not require you to take the USB flash drive out from your pocket and connect it to the PC. This idea will see a RF module that offers a dock for the said USB flash drive, and this dock will then communicate with the PC. Well, anything that helps save you one more USB port on the PC is a good thing, I guess.